I met my goal and got a row of letters stitched! 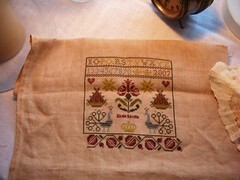 Next week I'll hopefully finish up the letters and then get back to the pomegranate border. I'm going to work on Winter Wind tonight. I searched and searched everywhere for this project. I thought for sure it was lost and then I just found it. I was a little worried there for a minute. 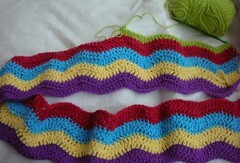 While waiting for ds at school today I worked on his ripple afghan some. I think it's turning out very cute in a kitschy sort of way. I love how the afghan is turning out. What pattern are you using? The Pomegranate Sampler looks great! And very nice work on the afghan too. Your sampler is really coming along nicely. Your doing a great job sticking with your rotation. Keep up the good work! Pomegranate Sampler is looking so pretty! I may have to have that design!! Your Pomegranate Sampler is coming along nicely. It's such a beautiful piece. I love to crochet but unfortunately I have tendonitis that doesn't like crochet and so I don't do it any more. It's nice to see your lovely ripple 'ghan.